There has always been much discussion among scholars about whether conditions in Russia were improving between 1906 and 1914. An interesting debate (optimists argued that conditions were getting better and that it was only World War I which doomed Russia to revolution vs. pessimists who held that Russia was not getting better and that revolution was imminent in 1914, postponed only by the outbreak of war) over Russia's "progress" before World War I took place in the Slavic Review issues of December 1964 and March 1965: Leopold Haimson, "The Problem of Social Stability in Urban Russia, 1905-1917" (in two parts); Arthur Mendel, "Peasant and Worker on the Eve of the First World War"; Theodore von Laue, "The Chances for Liberal Constitutionalism"; and, Haimson, "Reply." Also in this vein, Hans Rogger, "Russia in 1914," Journal of Contemporary History (October 1966). Compare that to the contemporary debate over Russia's direction in Vekhi. On the one hand, there did exist a very conservative parliamentary regime; on the other hand, there was a tsar who still believed that he was an autocrat. On the one hand, there was continuing rapid, economic growth; on the other hand that meant the further development of a very radical working class, growing larger and concentrated in the key political centers of the country. On the one hand, there was an effort made to address peasant affairs; on the other hand it was unclear how far or fast any transformation of the Russian countryside was taking place. On the one hand, you had an impressive cultural resurgence taking place in the Silver Age; while on the other hand the figure of Rasputin towered over the royal family. Personally, I feel that Russia was headed for disaster with or without the war (I am pretty certain that the Bolsheviks would never have been able to seize power in Russia without the conditions generated by World War I--the revolution would have been of a far different character, but there would have been a revolution nonetheless). Why do I feel that Russian was headed for disaster? 1912 Lena Goldfields Massacre (4/17 April 1912). Workers toiled in unbelievably harsh working conditions in a number of goldfields along the Lena River in Siberia. In March 1912 a strike broke out at one of the goldfields over working conditions, and soon the strike spread. Soldiers arrived to restore order, and when the strike organizers were arrested, a crowd gathered to demand their release. The troops opened fire on the crowd, 270 dead and 2500 or so wounded. This was unbelievably--sorry that I had to use that word twice in a single paragraph--stupid. The public was outraged; there were inquests held; but the ultimate outcome was a spectacular rise in worker unrest and the strike movement in Russia. Workers were further radicalized by the massacre; there was little good will left towards the regime. The assassination of Petr Stolypin in 1911. Ok, he might not have been the most-loved minister in Russia; and true he had resorted to some rather harsh tactics in dealing with terrorists, but he was one of the few politicians who had a vision of Russia and the competence to carry out his ideas. A tsar who was completely clueless about the political realities of Russia; one has only to read the "Fundamental Laws" (article four should suffice) to see that. His coup d'état of 1907 and also his unwillingness to work with the Duma also did not bode well for a peaceful evolution of a constitutional regime in the country. As soon as I find some of the tsar's diary entries and letters, I will post them on the website as further evidence of his disconnect from the real world. Grigorii Rasputin (1869-1917), need I say more. The existence of a very radicalized intelligentsia and middle class that were both willing to consider the use of political tactics towards the radical side of the scale. I would also include here the widespread terrorist movement in Russia. The fact that sectors of the population felt so disenfranchised to resort to terror to try and achieve political ends was not a good sign of political stability. Peasants, peasants, peasants. Russia was still 85% or more rural; what to do with all the peasants whose situation was not improving; what to do about all the peasants fleeing to the cities to try and find work in the factories? The slow penetration of primary education in Russia meant that more and more people in Russia were being given the tools to understand the nature of the political regime in Russia. Those people were going to demand change; indeed, they already were. in the happy days before soldiers actually started dying. I'm not going to go into a lot of detail about Russian military campaigns in the Great War, as you can find a lot of information on the great websites that I have listed below. Let's just say that the Russian war effort was not well done, to say the least. Russia was plagued by inferior communications systems; a scandalous lack of weapons and arms; a broken transportation system; a horrific sanitary/hospital service that was just overwhelmed; and, at times, a complete lack of effective leadership (too many officers who achieved their rank as a result of their noble status). Let me also add that Russia was never troubled by a lack of bravery; it's just that Russian solders had too many handicaps to overcome. Russian troops always fought extremely well when matched against any foe (Austrians or Turks) other than the Germans; Russian soldiers just did not stack up well with the professionally-run German armies. That said, the real military disaster for Russia occurred in the first two months of the war in the battles of Tannenberg and then the Masurian Lakes, two crushing defeats at the hands of the Germans. I'm going to simplify a bit. The Russian plan was to advance two armies into Prussia in a pincer movement to ensnare the German armies there. The German plan for the start of the war was to hold off the Russians while the major attack was against the French in the West, the Schlieffen Plan. Even more so, the German plan called for limited German forces (only the Eighth army) to be deployed against the Russians, thinking that it would take a long time for the Russians to mobilize their army given the size of their country. The Germans would use almost all available troops in the sweeping maneuver through Belgium against the French; to knock the French out of the war quickly, and then the Germans could deal with the Russians. 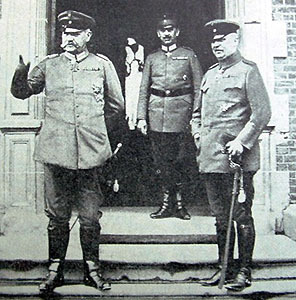 The German General Staff in their war plans did not account for two conditions: a) the Russians were able to mobilize much faster than anticipated and b) as soon as the Russians actually crossed into Prussia there was such a hue and cry raised by the Prussian citizens, and especially the Junker class, that the German high command could not just ignore those complaints as the Eighth army retreated in the face of a modest Russian advance. The Germans had to move some critically needed troops from the assault on Paris to the Eastern front to defend against the Russians. Ok. The Russian advance into East Prussia was fraught with problems. 1st, there was no good railway system to the front so supplies were not quick in reaching frontline troops and troop movements were extremely slow. 2nd, the Russian communications system was a mess; so bad that at times there was no effective communications between army units. Many messages were not even sent in any kind of code, others were sent in a simple code easily cracked. 3rd, the two Russian army commanders, Aleksandr Samsonov and Paul von Rennenkampf, did not get along as a result of some disagreement over tactics at the Battle of Mukden during the Russo-Japanese War 1904-05. This fact was known to the German chief-of-staff, Colonel Max Hoffmann (1869-1927), who had served as a military observer during the Russo-Japanese War and who had long been an observer of Russian military affairs. He would be the real mastermind of the German victories in East Prussia. The Russian advance was supposed to be a pincer movement; but the two pincers never acted in coordination and moved too far apart with Samsonov getting too far out in front. The result proved to be a disaster for Russia. 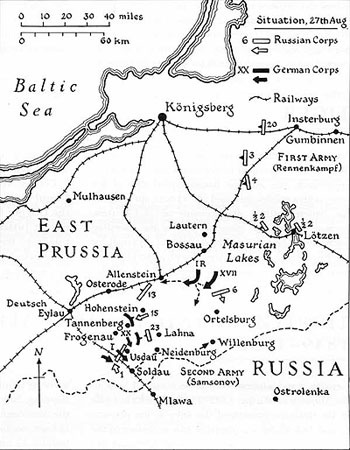 In the span of about a month, the German generals Hindenburg and Ludendorff won two smashing victories against the Russians, first defeating and almost totally wiping out Samsonov's Second Army at the Battle of Tannenberg and then Rennenkampf's First Army at the Battle of the Masurian lakes. The result was two Russian elite armies gone; officers, weapons, artillery, about 300,000 men. Only 10,000 soldiers of Samsonov's army ever made it out of the German encirclement; Samsonov shot himself. 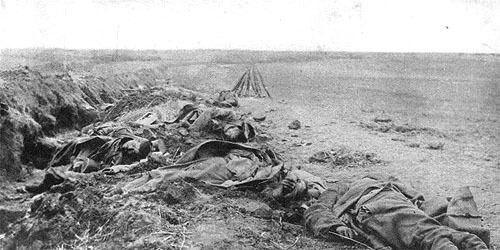 German casualties were on the low end of about 40,000. Was there a silver lining to the Russian catastrophes? Yes, the Russian effort had diverted a significant amount of German troops from the attack on France; probably just enough to ensure that the French would be able to prevent the Germans from reaching and encircling Paris. The French were able to launch a counter-attack, the First Battle of the Marne, that stopped the Germans. In other words, we can easily argue that the only reason that the Germans did not defeat the French in 1914 was because of the Russian sacrifice of their armies in September 1914 in accord with the desperate pleas of their allies, the French, to do something. A lot of Russian soldiers gave their lives so that the Germans would not conquer France! Despite occasional glimpses of military success, the Russian war effort did not go well through 1915 and 1916. Continuous communications, weapons and ammunition problems dogged Russian soldiers. There were instances when soldiers were lined up for an attack on enemy lines without weapons and simply told to pick up the weapons from the soldiers who fell in front of them. The war was particularly brutal on the Eastern front given the winter weather conditions in which the men had to fight. 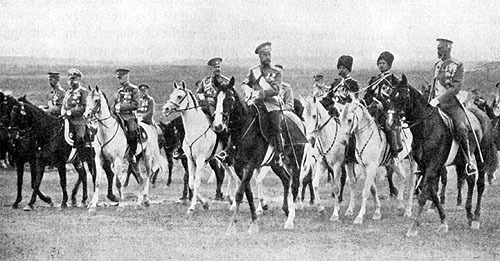 In many respects the decisive point came in 1915 when the tsar decided to take personal command of the Russian armies and relieve the popular Grand Duke Nikolai Nikolaevich. Edvard Radzinskii, The Rasputin File (2000). There is a lot of semi-hysterical stuff out there about Rasputin. Much of it is very interesting reading, although of little scholarly value, but still worth reading.